We’re getting really excited at CodeWeavers with regards to our CrossOver Android Tech Preview. Our development team has made incredible progress on this product, and we’ve very close to delivering an official release to the Google Play Store (within weeks really). For those that don’t know, the next official release of CrossOver Android will have support for Office 2010, 2013, and 2016; support for the Steam client; support for countless games (like Wizard101); and support for hundreds of other applications right ‘out of the box’. Additionally, we’ve spent considerable effort and energy in allowing end users to try countless other Windows applications on their own. Some of these applications will run. Some of these application will not yet run. Some of these applications won’t be supported by the hardware. Regardless… you’ll be able to try this for yourself in five simple and easy steps, as shown in the video below. Our design team has also spent a great deal of effort making CrossOver Android a bit prettier, a bit more functional, and a bit more intuitive to use. The result is a user interface that lends itself very nicely to Android and ChromeOS. We’ve also integrated multi-window support so that you can run multiple Windows applications at the same time; and we’ve incorporated icons that can launch applications straight from the dock. That may not sound like big improvements to you, but it gives for a very seamless and integrated user experience much like you would expect from any native Android application. All told, CrossOver Android is quite usable; quite stable; very integrated; and easy to use. We’re excited in what we are seeing, and we hope that you share our enthusiasm. >>> IS THAT A LAPTOP IN YOUR POCKET? OR IS YOUR PHONE JUST REALLY SMART? Now like all versions of CrossOver Android, we require that your device has an Intel processor. If your phone, phablet, tablet, or Chromebook is using ARM, our software will not yet work. Additionally, it’s a requirement that your Chromebook be a model that has access to the Google Play Store and can run Android applications in order to run CrossOver Android. If you meet these requirements, you’ll be able to successfully install and launch CrossOver Android. 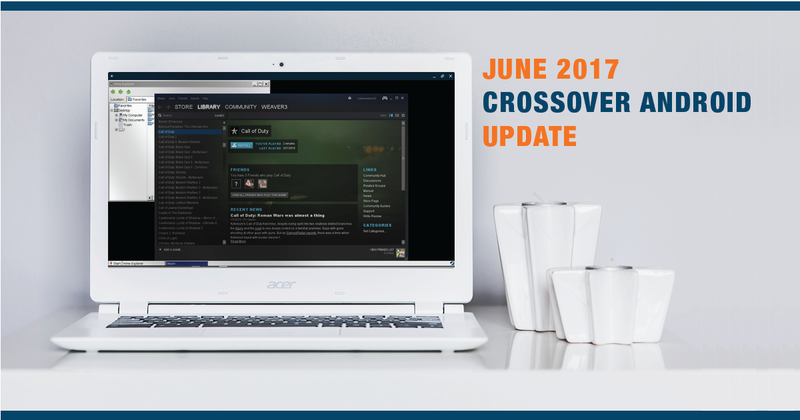 Thank you for your continued support of CrossOver Android. We look forward to getting this into the hands of many more users in a very short timeframe. And we appreciate all the feedback and questions that we’re getting from end users.